I found this awesome chunky cable knit cardigan at a local flea market the other day, it was a real bargain and looks so nice. I immediately liked its warm cream/brown color and the faux fur trims, it's really comfortable and perfect for campfire nights. Today I wear one of my newest dress in this post, it's the ultimate grey/blue dream. It got a gorgeous V Neck cut AND bell sleeves which are my all time favorite style. It's a cute piece, really boho and is so flowy on hot summer days like these lately. Definitely one of my most worn pieces this month. Outfit: Fell On Black Days. Definitely one of my favorite looks this month! I saw this beautiful biker inspired denim jacket on Instagram the other day without knowing where it was from, so I searched for it and found it! 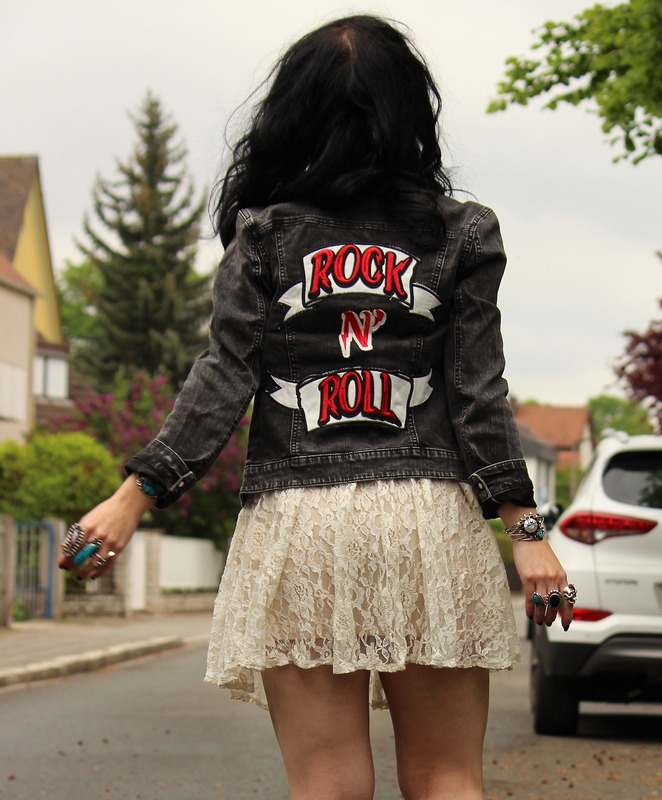 It's such an amazing denim jacket, I really dig the back patch. I combined it with a lace dress for some grungy "girl" look - lace dresses go literally with everything at any occasion. Outfit: Drown me slowly, enclose me. One of the cutest SS17 collection dresses so far! This one is from my favorite Aussie brand Spell Designs and I immediately liked its gorgeous 70s rust colors and bell sleeves (my favorite kind!). It goes with almost everything, I wore it with a brown fringed leather jacket the other day, it's such a great piece. Summer as well as autumn, those colors totally nail it. 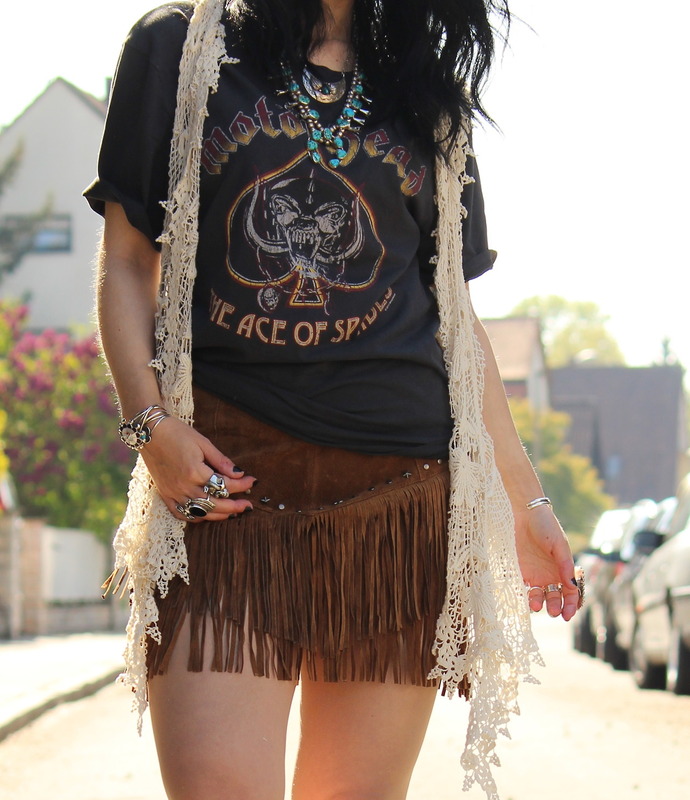 For this Friday I have a grungy Rock 'N' Roll look combined with a bit of a hippie vibe. I ordered this nice shacket in tie dye colors from Toyshop the other day, I really like its soft and versatile fit! It looks good on its own like here or even for layering it's a good piece. Here I combined it with my Joy Division top (one of my all time favorite bands! ), my buckled leather skirt I own almost for 3 years and some grungy fishnet tights. Outfit: Black Hole Sun Won't You Come. Today I'm wearing my newest summer dress, isn't it beautiful? It's made of a beautiful burned out silk velvet in lilac and rose pink colors. It's like the ultimate dream dress - kinda like a very very chic and glamorous, but vintage inspired bohemian dress. My favorite details are the cut-out shoulders! Those make the dress look even more cute. Rock 'n' Roll festival vibes for today - I'm really digging this look, it's become one of my favorites lately. Especially because my tee really matches the tan suede color of my fringed skirt. To add some "edge" to the outfit I threw over a crochet vest I already own many years. Outfit: Where are you now?